People all over the world have recently been supplementing their income through renting out spaces in their homes as vacation rentals. Whether you’re an experienced host, just getting started, or are still thinking about whether you should get in on the action, we want to help you decipher the wealth of information at your fingertips to make the most of your property’s potential. 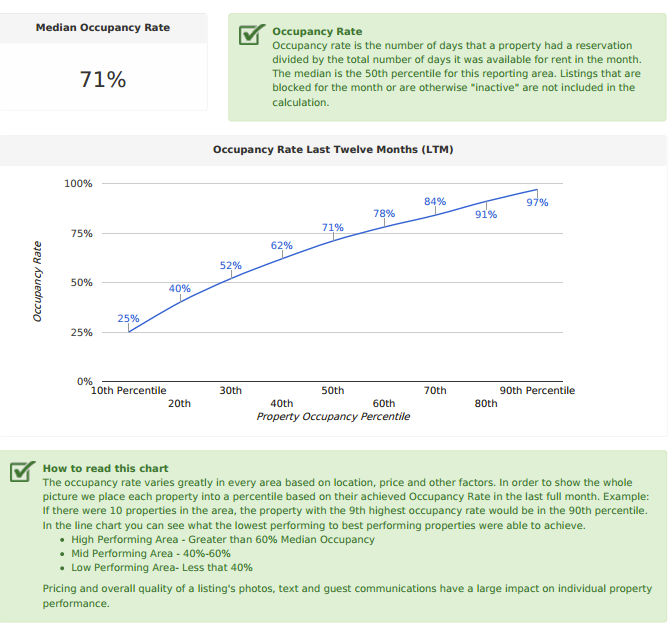 The tricky thing about working with data is taking all the new terms and graphs and extracting not just the basic information, but understanding the underlying reason for why these specific qualities can increase or decrease the profitability of your vacation rental. To illustrate this, we’ve taken raw stats presented by AirDNA to educate you about what real-life practical solutions you can use to increase your occupancy. With the growing demand for vacation rentals, there is an increasing availability of data service companies that give hosts the information they need to maximize profits from their vacation properties. Here, you’ll find a quick breakdown of the different kinds of details available to you. Most vacation rental reports will include basic information about your chosen city, including population, number of homes in the city, and the average income of its residents. At AirDNA, they go a step further and provide a basic breakdown of how many of each type of rental property is available. This is important because it can identify what kinds of properties are the most common or show you a niche market without much competition that you can take advantage of. AirDNA provides data using only actively rented properties to ensure that the information is accurate and practical. 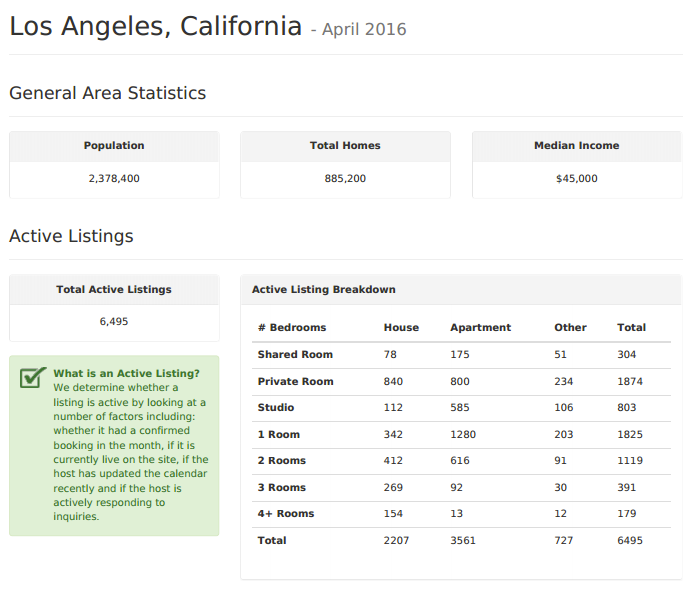 By taking a look at this chart, it’s easy to see that private and 1-bedroom listings are extremely common, consisting of over half of the listings. While there may be a large demand for these kinds of properties, it may also mean that it will be harder for a new property to stand out amongst a large number of competitors. While the market for shared rooms or large 4-bedroom properties may be smaller, there will also be fewer competitors. This is the kind of information which may influence a host’s decision on whether or not to list a similar type of property. Knowing the history of listings can come in handy. This kind of information shows the overall increase or decrease of active listings in an area on a month-by-month basis. There are many reasons for listings to be taken off the market, but if the general pattern of growth is negative in your area, you may want to reconsider if your property will have a good chance of being profitable or not. Occupancy rates are extremely varied between locations, so it’s important that you have accurate information about your property’s area. Occupancy rate is calculated by the number of days rented divided by the number of days it was available to rent in a month. That means if your property is only available 10 days a month but you rent it out on 8 of those days, you would have an 80% occupancy rate. This chart shows the median, or average, occupancy rate for all San Francisco rental properties over the last 12 months. The 71%-rate denotes a strong demand for vacation rentals in the area, so even new listings without many reviews could become quickly profitable. When compared to other areas that may only have a 50% median occupancy, that 20% difference could be as much as an extra week of booking per month. 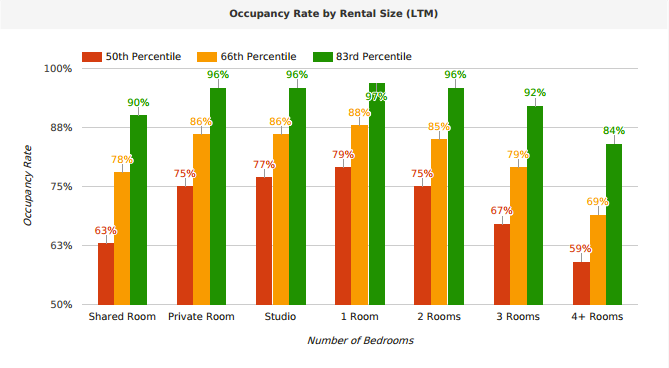 Most importantly, this graph breaks down the occupancy rate for each specific type of property. The best maintained, most beautiful buildings won’t make you any money if there isn’t much demand to fill it. This may help you decide which kind of property to buy if you plan on renting it out full time, but it may also help you decide whether or not you want to list an extra room in your home. In San Francisco, private and small properties can do quite well, but larger properties or shared spaces might be a challenge to consistently book. 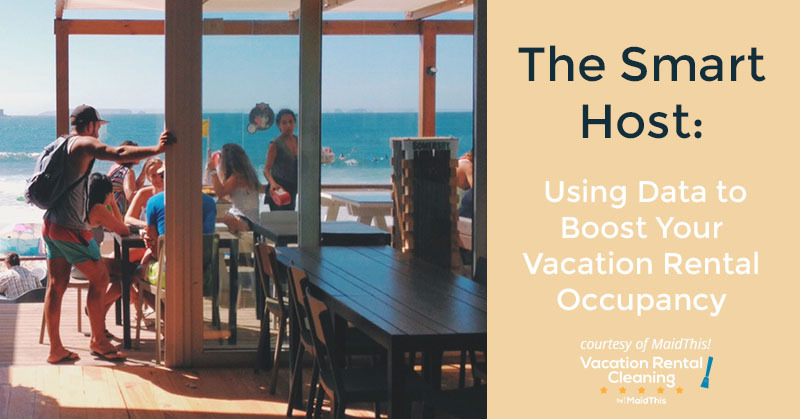 There’s a lot of data available about revenue that is made through vacation rentals, but there’s one particular metric that is incredibly helpful. Revenue per Available Room (RevPAR) is a standard hotel industry metric that can be broken down on a weekly or daily basis. This helps you identify holiday or weekend spikes so you can raise your listed price to take advantage of the increased demand. You can also see where slower periods are and decide if a lower price would be more competitive when compared with other listings in your area. Average Daily Rate information will show the actual price a property type was rented for, not just the price it was listed at, so it’s a much better standard on which to base your own pricing. You may see studios in San Diego listed for $150 per night, but if the stats show people are only willing to spend $100 per night, you may want to consider adjusting your prices. Pro Tip: It’s important to note that the number of occupants has a strong effect on your profit, so simple solutions like adding air mattresses or cots to a 1-bedroom apartment to accommodate additional guests is a great way to make extra money. This is where you can really set your vacation rental apart from the others. While most of the information available to you is very dependent on the particular kind of property you own or its exact location (which may not be something you have much control over), various fees, policies, and amenities can be game changers when it comes to maximizing your profit. In general, most vacation rental data services suggest it’s best to simply reduce fees and deposits as much as possible, aside from cleaning fees. Your guests are already planning to spend a lot on their vacation, so offering them opportunities to save money by not requiring expensive deposits or extra charges can make your listing much more attractive. Pro Tip: Policies concerning minimum stays, instant booking, and cancellations can have a large impact on your occupancy rate. To be a consistent top performing property, offer minimum stay lengths of just a night or two. These policies can always be extended during peak periods to take advantage of an increased demand. Instant booking is another tool that allows you to appear more often on vacation rental reservation sites. However, while minimizing fees is important, it’s also necessary to be strict on cancellations. Last-minute cancellations can ruin your chances of filling a room and shrink your profitability. The amenities you offer can also make or break your occupancy rate. Things like wifi and a kitchen with basic tools are essentially standard. Offering properties without them is extremely inadvisable. By contrast, if you have a gym or pool available or are willing to host guests with pets, you will likely be providing something rather unique for your area. The information we’ve discussed can be pretty detailed and descriptive, but vacation rental data services still offer more. Reports generally include stats on topics such as host responsiveness and experience and detailed ratings of properties. AirDNA is definitely our #1 pick, though other popular services include InsideAirBNB and the official AirBNB data archives. Now that you’ve got all the information and know-how, you can start working on easy, practical solutions to raise your occupancy rates and boost your profits. Once you’ve made the most of your stat reports, schedule an appointment with MaidThis! for a worry-free cleaning and start getting the most out of your vacation rental!